For quite some time I had been seeing a situation where database restores were slowing down after 50-60% of the restore was completed (you can output restore progress using WITH STATS = <some value 1-100> or use DMVs or sp_whoisactive). This was not really a big deal with small databases, it would just take an extra couple of minutes to complete. But when I had the need to restore a 16 TB database it became a real problem. This issue I could reproduce time and again. Something was up with the product. In investigating I kicked off another restore and watched the process. Things started swimmingly reading from the 4 backup files on the NAS and processing fast. Then the restore seemed to complete reading 3 of those files and slow down dramatically reading the fourth one. At the same time I could see a single core on the database server being pegged at 100% usage. There wasn’t anything I could do to resolve this issue (short of using a ridiculous number of backup files in an attempt to make the low perf period as short as possible). Given that this had the potential for a real RTO/RPO problem it was time to call in the big guns over at Microsoft support. We ran through a few more scenarios including taking stack dumps during the period when the restore was low (DBCC STACKDUMP <- NEVER EVER DO THIS ON A PROD SYSTEM). Working through the dumps the MS support engineer found bug from last year whereby disks formatted with a 4K sector size could experience slow restore performance. I checked up on my servers to confirm that we were using 4K using the built in FSUTIL command. In this case FSUTIL FSINFO NTFSINFO <drive>. This provides a wealth of useful information about the disk, and showed that it was indeed using a 4K sector size. The sad thing for me was that the particular instance I was restoring to was SQL Server 2012, for which no patch was released (as that version is out of mainstream support). But I was able to confirm that the slowdown did not happen when attempting to restore against an appropriately patched version of a fully supported version of SQL Server (time to put on the harder press for convincing management to allow us to upgrade). So if you are seeing problems with restores getting slow and are on SQL Server 2014/2016/2017 get yourself patched up to date. If you are stuck on an older version either redo the low level formatting on your storage (not recommended), take uncompressed backups (mildly recommended), or work to get yourself on a fully supported version of the product. Tuning your backups is a wonderful thing. You could easily reduce the time it takes to backup your databases by 50% of more just by changing a few settings, and yet so few people do it. I asked myself the question why and came up with two answers. 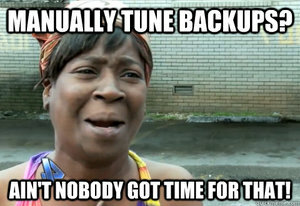 People do not know how to tune their backups. It takes too long to run through the tuning process. I’m not going to go over methods for tuning your backups in this post. There are people who have done a far better job at both explaining the adjustments you can make and that have created videos to help you understand and perform the process yourself. My biggest concern was directed at the level of effort required to test all the possible permutations of files, maxtransfersize and buffercount values, after all, who has time to figure all of that out and then capture the data to look at the relative performance characteristics of each one? I decided that the best way to do this was to create a nice little test harness which would run through all those tests without manual intervention, and then figure out a way to get the output from all of those backups into some kind of meaningful graph for that instant visual on performance differences. When executed the script is designed to created SQL Agent job which you can then execute at a time of your choosing. The job will run through a series of backups for a database (at minimum 40) and capture the information in the job log file. Be warned, performing this many backups test, with so many settings, can and will impact your server performance at some point. Be aware of this. Do not cause issues for your users when performing the tests, they will not like you for doing so. Getting that information usable is done using a PowerShell script. A blog post by Jonathan Kehayis described his method for parsing SQLIO output to excel charts. Based on this script, the update version parses the backup log file that has been created, imports the information into excel and creates a couple of charts. 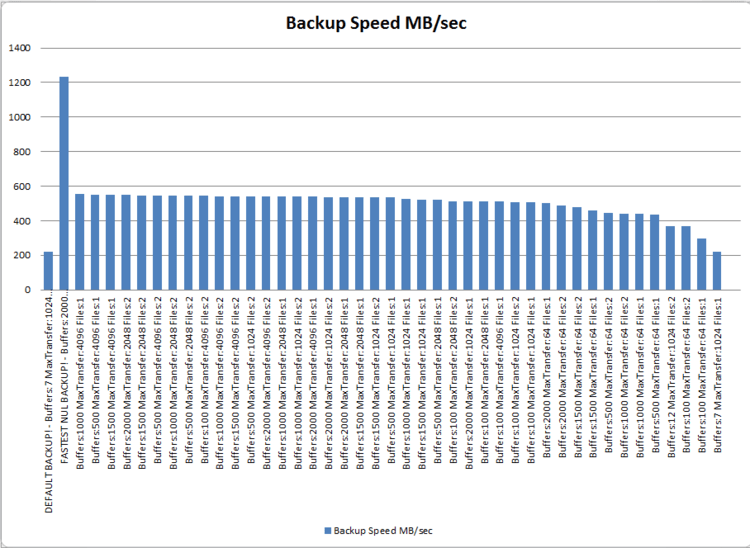 These charts show the speed (Figure 1) and backup time (Figure 2) for the default backup options, the absolute fastest backup to NUL, and the all of the other options that were tested. The graphs provide a nice visual representation of the backup performance which helps to quickly identify that there are improvements that can be made. 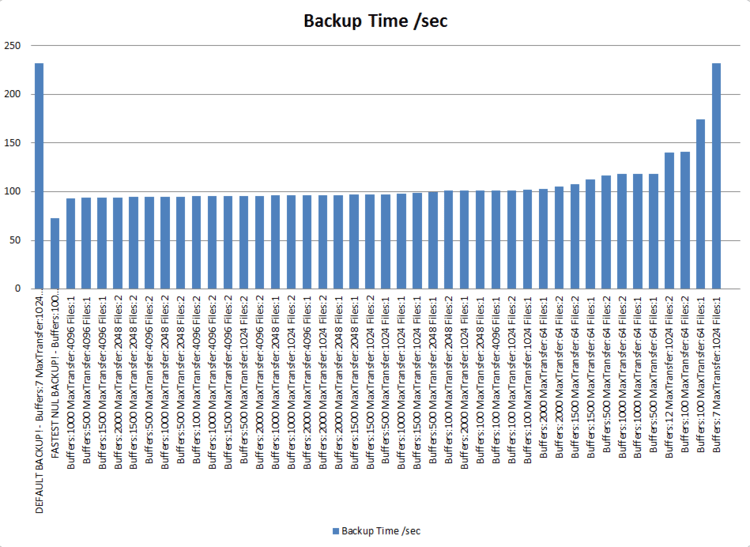 The default SQL backup runs at just over 200MB/sec and takes about 235 seconds to complete, but we know that we can perform that same backup to a NUL device in about 75 seconds at a rate of over 1200MB/sec. Just looking through the rest of the data it is clear to see that a lot of the values used make a negligible change to the performance of the backups, so we can work to make an informed decision on what the best file, maxtransfersize and buffercount settings should be. Hopefully this is something that you can find useful. Please give it a try and send me feedback on your testing efforts. The other day I found myself in the position of needing to restore multiple databases to a server. In this case all the log files would be on one drive and all the data files on another. Rather than sit there and write restore scripts for ~20 databases I figured it would be quicker to create a quick wrapper that I could just pass the filename into a then let nature take its course. This is very basic, no restore performance tuning enhancements for example, however it does just the job that I need it to. If I was smart I would have made this a stored procedure and then iterated through the list of backups in the directory using powershell and then executed the proc for each one. Maybe next time. I’m in the middle of a server migration and so I’m setting up log shipping to get the databases consistent between the two servers prior to cutting over. The backup copy over the WAN was taking a long time and so I had a lot of transaction log files that I needed to apply. I could have let log shipping take care of performing the log restores, but I found that a secondary process had created log backups also, just with different names. This lack of consistency was causing me a problem so I needed a quick way to build a restore command of all the files in order. This was a quick win for PowerShell. I was able to quickly grab a list of the files in date order and pipe those to a string and build the restore command. This I was able to copy into SSMS and perform the restores. $text = "restore log MyDatabase from disk = 'P:ForRestore$restorefile' with norecovery;"
If you wanted to take this a step further you could actually use invoke-sqlcmd to execute the $text string and perform the restore (don’t even contemplate doing that if you aren’t running at least SQL 2008 R2). I always prefer to do that within SSMS though. While I’ve used this script for a migration task it also works really well if you need to perform a point in time restore for your database from a full backup and some transaction log backups. Can you imagine how long it would take you to build out the restore string to recover a database which had transaction log backups every 15 minutes for the last 20 hours? That’s 80 log files. Want to do that manually? This is a much nicer way to go. You can Google/Bing/AltaVista and get a lot of results for speeding up your backups. Those results will include using third-party tools, performing file and filegroup backups, differential backups and the like. Some of the more technical blogs will talk about adjusting some of the backup parameters to improve throughput. There’s really not much written (that I’ve found, please add comments with links to posts you’ve found) that talks about tuning database restores. I started messing with some restore parameters last week and found that it’s possible to make some dramatic performance improvements. We were performing a data center migration at work. As a part of this migration we were going from SQL 2000 to SQL 2008R2 for some of our databases. The database, we’ll call MyDB, is 620GB in size. There are 5 data files and a single log file. Current backups are performed using Snap technology, which wasn’t going to help us with performing a migration as we needed to get the data over and setup logshipping, so we needed to perform a regular backup. Third party tools were not an option as this SQL instance was running SP3a and we weren’t able to find anything that would work below SP4. A full backup was taken to local disk, it took a little over 9 hours (server and disk limitations prevented any work to try and improve that). The backup file was transferred to a USB drive, taken to the new datacenter and copied over to a CIFS share where it would be available for performing restores. It’s going to help to have an idea of the configuration that’s being used here. The initial restore was performed with default options, no optimization was performed. I knew that adjusting the MaxTransferSize and BufferCount settings could provide significant improvements in backup performance (go read a fantastic SQLCat article on this) and figured that the same would be true for performing restores. Before I could start changing values I needed to know what values were being used with the basic restore. To do this I enabled trace flags 3213 (trace SQL activity during a backup/restore) & 3605 (output trace activity to the SQL error log). So by default we’re running with a BufferCount of 6 and MaxTransferSize of 1,024. The MaxTransferSize value is the largest unit of transfer to be used between SQL Server and the backup media. This is specified in bytes and can range in value from 65536 (64 KB) to 4194304 (4 MB). The BufferCount specifies the number of IO buffers to be used for the restore operation. Any positive number can be used for this, however you have to be careful with larger numbers as you could potentially cause out of memory errors. Not having any obvious hardware restrictions I decided that as the restore was being performed across the network adjusting the MaxTransferSize might provide the biggest benefit. Feeling confident I just bumped it to the max and performed the restore. This time the restore took 45 minutes, a reduction of 2 hours over the default. Having already reduced the restore time by over 70% I wanted to see if I could get a little bit more performance from it. So I made an adjustment to the BufferCount value and set it to 75. This restore took a little less time, 38 minutes, shaving another 7 minutes off the already shortened time. At this point I was down about 78% over the regular restore command. I tried pushing the BufferCount to 100 to see if I could trim things further but found no appreciable difference and so left it at 75. As a part of the move log shipping was to be setup to offload reporting for users and so I needed to perform a restore of the database from the new SQL 2008R2 server to another with exactly the same specifications. The native SQL 2000 backup file was 520GB in size, with no optimizations it restored in 2:48, and optimized restored in just 38 minutes (not bad for a network restore). The compressed SQL 2008R2 backup file was just 121GB in size. An optimized restore of this database took just 23 minutes. That’s an 86% saving over the unoptimized SQL 2000 based restore. There are times when you are not able to perform partial restores, or you need to restore entire databases to a new environment in as short a time as possible. Don’t always accept the defaults that SQL Server will give you in these situations. There are things that you can do to improve the performance of your restores (and your backups). It’s worth your spending some time now working in your environment and optimizing your restores. A little time playing with these things now could be the difference between your database being down for 20 minutes as opposed to 3 hours. How much is 2 1/2 hours worth to your business? Allen Kinsel (blog|twitter) is running this months T-SQL Tuesday and wanted to know about preparing or recovering from a disaster. I thought this might be a good opportunity to tell a little story of how a disaster sucked up around three weeks of my life a couple of years ago. Not being able to come up with anything egregious I settled down the stomach gurgles and went wandering in. That I walked in and was offered a seat I got nervous again, this was not a good sign with this director. Now I was really curious as to what could be up. “Are you working on anything big right now?” were the words that kicked off something that changed my views on a lot of things. I quickly rearranged all of my plans for the next few days and resisted giving myself a facepalm until I was well clear of the office. The next morning I hopped on a plane and by mid-afternoon was at my place of destination. When I walked in the door it was all hands to the pump where people were rushing around like crazy and the smell of desperation was in the air. A couple of days prior there had been an attempt at a microcode upgrade on a SAN. The upgrade failed, crashed the SAN and corrupted all of the data. No databases could be attached or started, no files were accessible, there was no filesystem, nothing. It was bad. I asked at what point the decision was going to be made to scratch it and go to a backup (figuring if there had been a DR site for this it would have been in place already). Yup, you guessed it, there were no backups. I asked when the last time a backup was taken, someone stated that they thought a backup had been taken 9 months before, but they couldn’t be sure and they didn’t know of anyone that could get into that datacenter and see. The reason for no backup? Apparently it was taking too long to perform the backup and so the decision was made to just turn off the backup process. I came to find out later no effort had been made to tune the backup process or to attempt alternative backup methods. I find it unfathomable that there were no backups on a critical system that supported > 1 million users and had extremely high visibility. You would have thought that DR would have been priority #1, but that was not the case. While there was little that could be done with the dead storage there was a lot of work around what could be done as a mitigation strategy. What could be done to restore service while other work was done in an attempt to recover some amount of data. A new SAN was brought up, database installations performed, a change management process was put in place (one had not existed before) and there was a lot of discussion around getting backups working immediately. I didn’t move from the building the first 36 hours. Thankfully the company brought in three square meals a day for everyone that was there to ensure that we at least got fed. People were sleeping on the floor in offices just to try and get a couple of hours sleep so they could remain functional. Restoration of service was a slow arduous process as great care had to be taken with the order of enabling certain components. Slowly things got back to normal, hourly calls with the VP dropped to every four hours. I was able to sleep in a bed and get some rest and a change of clothes (at one point I told the VP I was running out of clothes and asked how much longer I was going to be there, his response was that I should probably go and expense some underwear). A little over two weeks after everything went kaboom we started getting word of some data recovery. A third party company had been brought in and had been performing a block by block recovery of the storage from the bad SAN. They were not able to pull files or anything that simple, they were just able to pull access data on blocks. With a great deal of effort they managed to recover 90% of the data, which then had to somehow get validated and reconciled with the data now in the system. Scripts abounded, levels of confidence in the data had to be decided upon and the risks ascertained for data restoration. That to me was a very scary concept. I’m glad that the decision on that one was made well above my pay grade. After about three weeks I was able to go home. My work (and everyone else who was sent down to work on the recovery attempt) was acknowledged in a company meeting a couple of months later. This is a real world example of a disaster. If there had been a backup a great many good people would not have been stuck away from home for three weeks. It gave me a much greater appreciation for what can happen in a disaster. Don’t get caught out, make sure your backups are good and you have a strong business continuity strategy. Recently I was contacted by Aaron Nelson (blog|twitter) who provided me an awesome opportunity to write a guest blog post for the Hey, Scripting Guy! Blog. 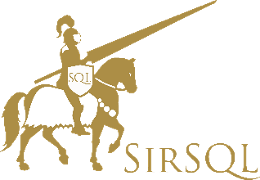 Naturally I jumped at the chance and the post went live this week as a part of a week of SQL related post in honor of SQLRally which is coming up next week in Orlando. My post was on using PowerShell to report on SQL Server backup status. Go have a read and let me know what you think. With the rest of the week being dedicated to SQL and PowerShell don’t forget to keep checking the Hey, Scripting Guy! Blog.